Chris Walters is proof that sometimes it pays off to spend a lot of time hanging out at a bike store. 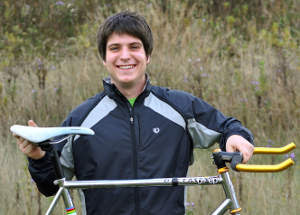 He was such a regular at Century Cycles in Medina that they hired him when he turned 16. Today, at the ripe old age of 20, Chris still works at the Medina store and goes to Lorain County Community College, where he’s pursuing an Associates of Arts degree with a focus on literature. He plans on transferring to Cleveland State next semester. Q: How many bikes do you have? A: I just whittled it down to four. They are in a work area in the corner of my basement. Q: So I take it your parents are supportive of your bicycling? A: Oh, yeah. When I was younger, my mom had me go on 10-mile bike rides with her. I hated it at the time – I just wanted to watch TV or hang out with my friends – but now I realize it was one of the big reasons I took up cycling. Q: What’s your favorite ride or trail? A: My favorite trail is Reagan Park. My favorite ride right now is my commute to work. It’s 13 miles, mostly on country roads. It’s real peaceful. Q: What cycling advice do you most often give? A: Clipless pedals are easier to get out of than toe clips, if you’re falling. Most people are scared they’ll be stuck in them, but you’re more likely to pull your foot sideways than backwards as you’re falling. Q: What was your first bike? A: My parents gave me a black-and-white tricycle with BMX handlebar pads. I still have it, but I didn’t count it in the six. A: I prefer dirt but I fall a whole lot less on the road. Q: Do you have a favorite bike? A: I do. It’s my single-speed Bianchi Pista. It’s just so simple. Q: What’s your biggest accomplishment so far on a bike? A: Probably finishing the ABC Ride on January 1 two years ago. I did it on a bike with a garbage-picked frame and scrap parts, wearing a wool jersey with gym shorts. I did the 27-mile loop and it started to snow and hail. Now that I have winter clothes I look back and wonder what was going through my head. Q: What three words describe how you feel on a bike? Q: What do you when you’re not at Century Cycles or on a bike? A: I’m going to school, so have quite a few writing and art projects. And right now I’m dating this incredible girl, so that takes up a fair amount of time. Q: What was the best piece of cycling advice you’ve been given? A: You only need brakes when you need them.